Ben Vinson, dean of the Columbian College of Arts and Sciences, addresses doctoral graduates at Lisner Auditorium Thursday. 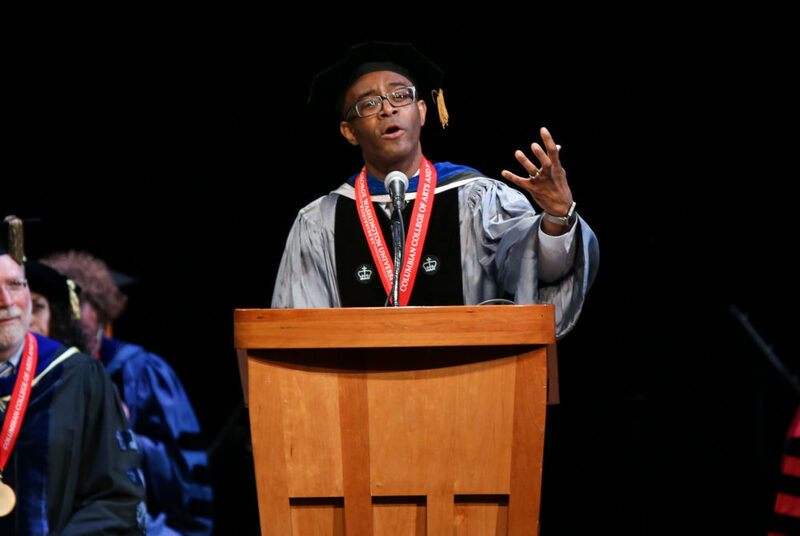 The new graduates were joined by family and friends in Lisner Auditorium, where speakers offered their congratulations and imparted words of advice. After the speeches, CCAS Dean Ben Vinson and faculty advocates gathered on the stage to bestow graduates with their colorful new hoods. Jeffrey Brand, associate dean of graduate studies and associate professor of philosophy, said some new graduates may be on a clearly defined path after graduating, but others may not yet know where they are headed. He said while a graduate’s career path might be uncertain, a doctoral degree gives them several options and serves as an accomplishment to always take pride in. “You’ve accomplished something immensely difficult, and I hope next time you’re about to start something big and challenging, and you’re not sure if you can see it through, you’ll always say to yourself, ‘Well, I finished my doctorate, so I bet I can do this,’” Brand said. Brand added that a doctoral degree grants students the right to call themselves an expert in a particular field, but he said graduates should still respect those who are not experts. “Don’t be the stupid kind of educated man, respect the expertise of others even when they don’t get to call themselves a doctor,” he said. Vinson said graduates should appreciate the significance of their hoods as they begin their next steps after graduation. Vinson said that receiving a degree from GW distinguishes graduates because CCAS was one of the first institutions in the United States to grant a doctorate. In receiving the prestigious degree, Vinson also told students not to forget how they have impacted their fields through their research as they move on to future careers.